Based on the largest study of its kind, this book is the first to present the fascinating findings of the Gallup Poll of the Muslim World. The horrific events of 9/11 dramatically intensified what many saw as an ongoing conflict between the U.S. and parts of the Muslim world. Extremism has grown exponentially as Muslims and non-Muslims alike continue to be victims of global terrorism. Terrorist attacks have occurred from Morocco to Indonesia and from Madrid to London, as U.S.-led wars rage in Iraq and Afghanistan. As of this writing, war and terrorism have already claimed more than 300,000 lives since 9/11; the vast majority have been civilians. As we face savage actions in a world that seems ever more dangerous and out of control, we are confronted daily by analysis from terrorism experts and pundits who see the religion of Islam as responsible for global terrorism. At the same time, terrorist groups like al-Qaeda beam messages throughout the world that demonize the West as the enemy of Islam, responsible for all the ills of the Muslim world. Amid the rhetoric of hate and growing violence, both anti-Americanism in the Muslim world and Islamophobia — discrimination against or hostility toward Islam or Muslims — have increased precipitously. In the aftermath of 9/11, President George W. Bush emphasized that America was waging war against global terrorism, not against Islam. However, the continued acts of a terrorist minority, coupled with statements by preachers of hate (Muslim and Christian) as well as anti-Muslim talk show hosts and political commentators have inflamed our emotions and distorted our views. The religion of Islam and the mainstream Muslim majority have been conflated with the beliefs and actions of an extremist minority. The result was reflected in a USA Today/Gallup poll, which found substantial minorities of Americans admitting to negative feelings or prejudice against Muslims and favoring heightened security measures with Muslims to help prevent terrorism. Nearly one-quarter of Americans, 22%, say they would not want a Muslim as a neighbor; fewer than half believe U.S. Muslims are loyal to the United States; and 44% say Muslims are too extreme in their religious beliefs. Are the growing violence and negative perceptions on all sides only a prelude to an inevitable all-out war between the West and 1.3 billion Muslims? The vital missing piece among the many voices weighing in on this question is the actual views of Muslim publics. With all that is at stake for U.S. and Muslim societies, indeed for the future of the world, the time has come to democratize the debate. Who Speaks for Islam? Listening to the Voices of a Billion Muslims is about this silenced majority. It is the product of a mammoth Gallup research study over the last six years. Gallup conducted tens of thousands of face-to-face interviews with residents of more than 35 predominantly Muslim nations. Gallup’s sample represents urban and rural, young and old, educated and illiterate, women and men. In total, we surveyed a sample representing over 90% of the world’s 1.3 billion Muslims, including Muslims in the West, making this the largest, most comprehensive study of contemporary Muslims ever. The concept of this book is simple. After collecting vast amounts of data representing the views of the world’s Muslims, we asked the questions everyone wants answers to: What is at the root of anti-Americanism in the Muslim world? Who are the extremists? Is democracy a desired construct among Muslims, and if so, what might it look like? What do Muslim women really want? 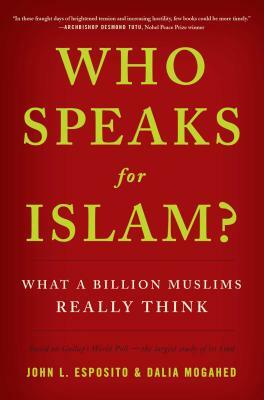 With questions in hand, we let the empirical evidence — the voices of a billion Muslims, not individual “experts” or “extremists,” dictate the answer. John L. Esposito, Ph.D., is a leading expert on the Muslim world. He is a university professor and a professor of religion and international affairs and of Islamic studies at Georgetown University and the founding director of Georgetown’s Prince Alwaleed Bin Talal Center for Muslim-Christian Understanding in the Walsh School of Foreign Service. He is also the past president of the Middle East Studies Association of North America and of the American Council for the Study of Islamic Societies and a consultant to governments and multinational corporations. He is editor in chief of the Oxford Encyclopedia of the Islamic World and Oxford Islamic Studies Online. His more than 35 books include What Everyone Needs to Know About Islam and Unholy War: Terror in the Name of Islam. He currently resides in Washington, D.C. with his wife, Jeanette P. Esposito, Ph.D.
Dalia Mogahed is a Senior Analyst and Executive Director of the Gallup Center for Muslim Studies. She leads the analysis of Gallup’s unprecedented survey of more than one billion Muslims worldwide. Mogahed also directs the Muslim-West Facts Initiative (www.muslimwestfacts.com), through which Gallup, in collaboration with The Coexist Foundation, is disseminating the findings of the Gallup World Poll to key opinion leaders in the Muslim World and the West. She travels the globe engaging audiences on what Muslims around the world really think. Her analysis has appeared in a number of leading publications, including the Economist, the Financial Times, the Wall Street Journal, Foreign Policy Magazine, Harvard International Review, the Journal of Middle East Policy, and many other academic and popular journals. She lives in Washington, D.C. with her husband Mohamed and two sons, Tariq and Jibreel.